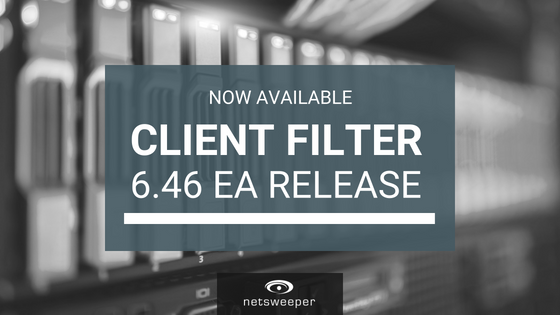 Netsweeper Client Filter 6.46 EA Release now available! The Netsweeper Client Filter 6.46 release has now been made available! It fixes a few small variances and improves stability on Windows and MacOS platforms. We recommend all customers running 5.x and 6.x versions of the Client Filters upgrade to the 6.46 release. If you are still running an older 3.x or 4.x Client Filter version it is also recommended to upgrade. If you have any questions, please don’t hesitate to reach out to support@netsweeper.com. Customers that have a branded Client Filter can also contact support@netsweeper.com to have the Client Filter 6.46 version built for them. For a complete list of changes and downloads see the 6.46 Change Log by logging into our HelpDesk.